Added to our Focus List – Short Model Portfolio on April 5, 2018. Investors will ignore a lot of red flags if they think they’ve found a diamond in the rough. This company has an alarming number of red flags. Its shrinking cash flows can’t cover its debt burden, its accounting is confusing and possibly unreliable, its industry faces technological disruption, and its valuation assumes implausibly high profit growth. These issues make Hertz Global Holdings (HTZ: $20/share) this week’s Danger Zone pick. Since 2007, after-tax profit (NOPAT) has fallen from $960 million to $196 million in 2017, and return on invested capital (ROIC) has fallen from 6% to 1%. Declining margins have been the primary culprit, with NOPAT margins falling from 11% to 2%. Investors in Hertz are hoping for a turnaround, but so far there’s been no sign that profits are stabilizing, much less returning to growth. Meanwhile, the company’s debt burden continues to mount, with net debt hitting $16.1 billion (84% of enterprise value) in 2017. The company’s NOPAT has not been enough to cover its interest expense in each of the past two years. Hertz is a difficult stock for the average investor to evaluate because its GAAP net income number is functionally useless. The company’s large debt load, frequent write-downs, unusual tax activity, and various other one-time items cause reported earnings to swing back and forth from positive to negative with no relation to the underlying economics of the business. In 2017, Hertz’s GAAP net income turned positive as a result of a $679 million gain from the remeasurement of its deferred tax liabilities after tax reform. In reality, as Figure 1 shows, Hertz’s profitability continued its long-term decline. Since GAAP numbers are even more misleading than normal for Hertz, investors pay more attention to non-GAAP metrics, especially adjusted EBITDA. Unfortunately, as shown in Figure 2, adjusted EBITDA significantly overstates the economic earnings of the business over the past three years (we don’t have comparable adjusted EBITDA numbers before 2015 due to accounting restatements and the spin-off of Hertz’s equipment rental business). Investors should be extra wary of Hertz’s reported profits (both GAAP and non-GAAP) due to the company’s history of accounting problems. In 2015, Hertz was forced to restate its earnings going back to 2011. One would imagine that such a significant problem would lead the company to emphasize accurate accounting going forward, but the company still has material weaknesses in its internal controls over reporting according to auditor PricewaterhouseCoopers. The inability (or lack of desire) to fix such a glaring problem poses a risk of further restatements and raises questions about management’s ability to execute a turnaround. Hertz’s executive compensation misaligns executives’ interests with shareholders’ interests. The misalignment helps drive the profit decline shown in Figure 1 and the disconnect between non-GAAP EBITDA and economic earnings. 80% of executives’ long-term performance share units are awarded for meeting adjusted EBITDA and adjusted EBITDA margin targets. The remaining 20% is tied to improvements in net promoter score, a measure of customer satisfaction. Tying executive compensation to adjusted EBITDA encourages wasteful investment and further accounting gimmickry. Executives can’t be expected to be responsible stewards of shareholder capital if their performance incentives don’t take capital allocation into account. Tying compensation to customer satisfaction is a better idea since it targets an underlying driver of the business, but multiple academic studies have called into question the actual efficacy of net promoter score as a predictor of customer loyalty. The bottom line is that improper incentives allow these execs to earn bonus awards while destroying shareholder value. We’ve demonstrated through numerous case studies that ROIC, not non-GAAP net income or similar metrics, is the primary driver of shareholder value creation. A recent white paper published by Ernst & Young also validates the importance of ROIC (see here: Getting ROIC Right) and the superiority of our data analytics. Without major changes to this compensation plan (e.g. emphasizing ROIC), investors should expect further value destruction. Hertz is a global rental car company operating under the Hertz, Dollar, and Thrifty brands. Its primary business comes from airport rentals. Hertz’s competitive position can be hard to analyze due to the fact that many of its competitors, both direct (Enterprise), and indirect (Uber, Lyft, etc.) are private companies. The only publicly traded competitor is Avis Budget Group (CAR). 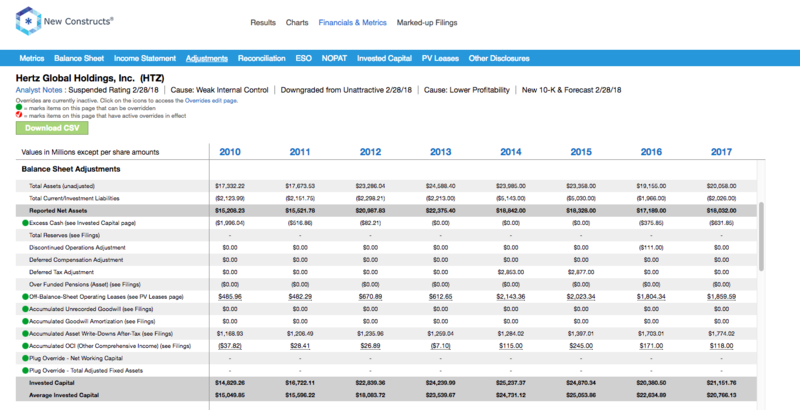 Figure 3 compares Hertz and Avis on measures of profitability—ROIC, NOPAT margin, and average invested capital turns (revenue divided by average invested capital)—and revenue growth. Not only is Avis more profitable than Hertz, it’s also taking market share, as evidenced by its growing revenue. Avis’ total rental days increased by 4% in 2017 versus a very slight decline for Hertz. Hertz’s declining share and inferior margins put it in a tough competitive position. It can’t afford to cut prices to reverse the market share decline, and its significant debt load limits the amount it can invest in improving its service. While we don’t have financial filings for Enterprise, available data shows it increasing its industry-leading market share. Meanwhile, Uber and Lyft are clearly cutting into the demand for rental cars, even if the exact size of their impact remains hard to quantify. Hertz investors are betting that ridesharing companies will not cut into the demand for rental cars as much as the market expects. Unfortunately, even if the rental car business does survive this new competition, Hertz could be squeezed out by its more profitable competitors. The bull case for Hertz largely centers on the potential value of the company’s fleet management system serving autonomous vehicles and ride-sharing services. The biggest recent boost to the stock came last June when the company announced a partnership with Apple (AAPL) to work on a small number of self-driving vehicles. The stock spiked 14% that day and wound up gaining over 200% over the next few months. However, HTZ’s announcement came the same day that Waymo (GOOGL) and Avis announced a much larger deal. While Apple only leased six cars from Hertz, the Avis/Waymo deal covered 600 vehicles in a multi-year arrangement. In addition, Waymo is a much more valuable partner in the self-driving vehicle space. A recent report by Navigant Research ranked Waymo as one of the leaders in self-driving vehicles. Apple, on the other hand, was a distant challenger. It makes sense that Waymo would prefer to work with the more profitable company in Avis rather than Hertz, which is losing market share and still has the lack of credibility from its accounting issues. While Hertz’s fleet management business has grown revenues in the single-digits over the past few years, it still only accounts for 8% of the company’s total sales. There’s no apparent catalyst for the fleet management business to produce the kind of dramatic gains necessary to offset the decline in the core rental business. Despite all its issues, HTZ is still up over 130% from its lows last June. Investors seem to be buying the turnaround story and the potential of the Apple partnership. A look at the expectations baked into the company’s stock price puts this optimism into perspective. To justify its price of $20/share, HTZ would need to immediately achieve NOPAT margins of 6.7%, comparable to CAR, and grow NOPAT by 11% compounded annually for 14 years. Not only is that a high growth rate for a company with HTZ’s track record, 14 years is also a long growth appreciation period (GAP) for a company facing such significant upheaval to its business. If we just shorten the GAP to 10 years, HTZ is worth $5/share, a 73% downside from the current price. The other bull case for Hertz at its current valuation comes from the fact that activist investor Carl Icahn owns a 35% stake. The quickest route to profits for HTZ shareholders would be for Icahn to acquire the whole company. The obvious flaw in this argument is that Icahn had a much more appealing opportunity to take Hertz private last summer when it was trading at $9/share. If he wasn’t willing to acquire the company at that price, it’s hard to see why he’d do so now when the stock price has more than doubled. 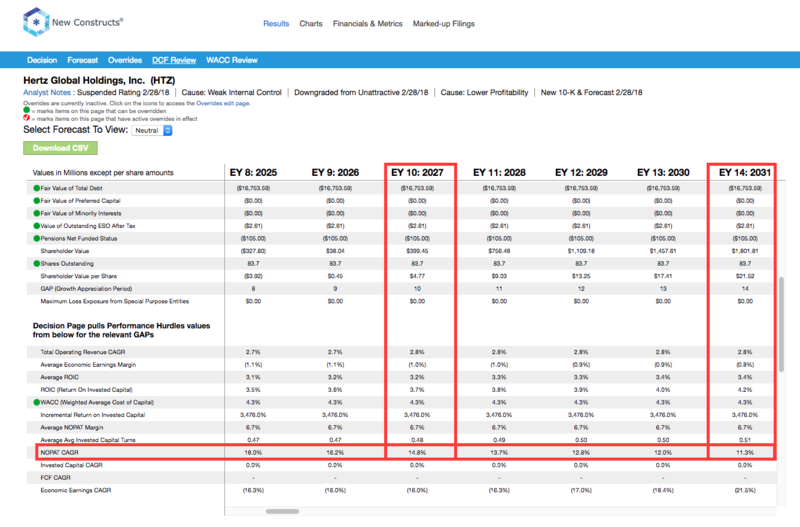 Figure 4 shows the revenue growth scenarios Hertz would need to achieve for Icahn to earn a 4% ROIC (equal to Hertz’s WACC) on the acquisition if we assume the company can match Avis’ 6.7% NOPAT margin. This is essentially the break-even point for the deal to have any economic value. The first scenario uses analyst projections for the first two years and a long-term revenue growth rate of 3.5%. If Hertz grows at this default rate for the next five years while achieving the same margins as Avis, it will not be worth acquiring at any price. Even If Hertz can double that growth rate, it would only be worth acquiring at a 39% discount to the current stock price. That’s a high hurdle for Icahn just to break even on a potential acquisition. Hertz faces a number of significant catalysts to send shares lower in 2018. As mentioned above, the company has had material weaknesses in its internal control over financial reporting for several years. Specifically, its auditor singled out the company’s accounting for income taxes, which is a big concern given the complexity of accounting for tax reform. Hertz will have more difficulty than most estimating the impact of tax reform due to its significant interest expense. The new law caps the deductibility of interest at 30% of EBITDA, which means Hertz will no longer be able to deduct a significant portion of its interest when accounting for its tax provision. The loss of this deduction will offset part of the reduced tax rate and limit the benefit to the company. If Hertz has overestimated the benefit when accounting for its deferred tax liabilities, it may be forced to take an additional loss in the coming quarters. In addition, Hertz faces a challenging business environment. The company relies on selling off older vehicles in its fleet as they become obsolete. 2018 is projected to see a large increase in vehicles coming off-lease, which will push down prices in the used car market and will put more pressure on the company’s already slim margins. Not only could these issues hurt the company’s cash flows, they could also lead to significant write-downs of either the company’s vehicle inventory or its $4.3 billion (22% of total assets) in goodwill and other intangible assets. Over the past 12 months, 101 thousand insider shares have been purchased and 41 thousand have been sold for a net effect of 60 thousand insider shares purchased. These purchases represent less than 1% of shares outstanding. Short interest is currently 19.3 million shares, which equates to 23% of shares outstanding and six days to cover. The significant short interest does increase the probability of a short squeeze and probably contributed to the significant run-up in the stock last year. Income Statement: we made $1.9 billion of adjustments, with a net effect of removing $131 million in non-operating income (1% of revenue). We removed $1 billion in non-operating income and $895 million in non-operating expenses. You can see all the adjustments made to HTZ’s income statement here. Balance Sheet: we made $4.4 billion of adjustments to calculate invested capital with a net increase of $3.1 billion. One of the largest adjustments was $1.8 billion in accumulated asset write-downs. This adjustment represented 10% of reported net assets. 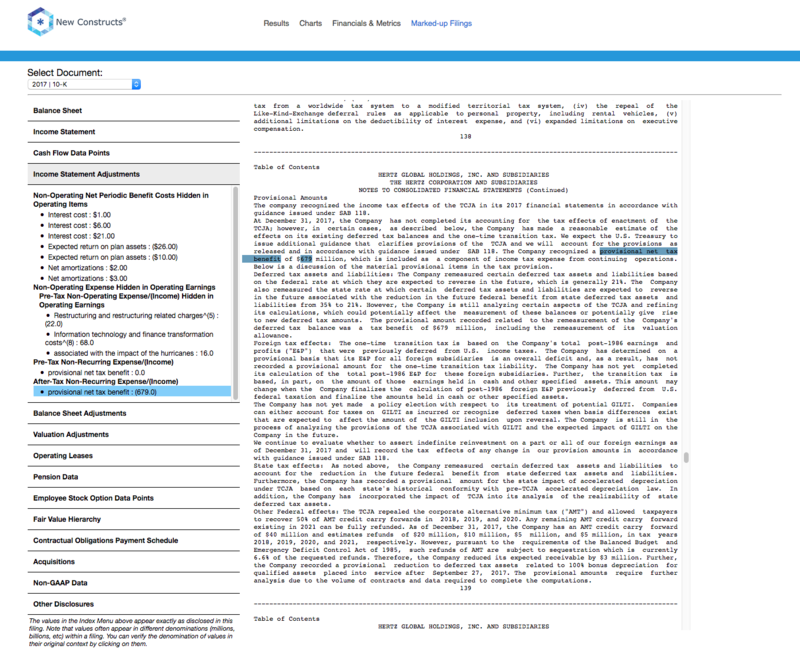 You can see all the adjustments made to HTZ’s balance sheet here. Valuation: we made $18.7 billion of adjustments with a net effect of decreasing shareholder value by $17.4 billion. In addition to the debt and deferred tax liabilities mentioned above, we subtracted $105 million (6% of market cap) for underfunded pensions. The following funds receive our Unattractive-or-worse rating and allocate significantly to Hertz. This article originally published on March 12, 2018. Ernst & Young’s recent white paper, “Getting ROIC Right”, proves the superiority of our research and analytics. 1 Response to "No Light at the End of the Tunnel for This Stock"